Reporting for duty as part of your own well-armed First Order! First Order Riot-Control Stormtrooper Action Figure! Seen in Star Wars: The Force Awakens. Comes with 3 sets of interchangeable hands and an exclusive support stand. Beast Kingdom announces the First Order Riot-Control Stormtrooper seen in Star Wars: The Force Awakens, holding their own with riot-control batons against lightsabers. Equipped with the standard all-white Stormtrooper armor customary of Empire forces and the exclusive SE-44C blaster pistol, they also carry the Z-6 riot-control baton and lightweight composite betaplast ballistic riot shield… true to the film. 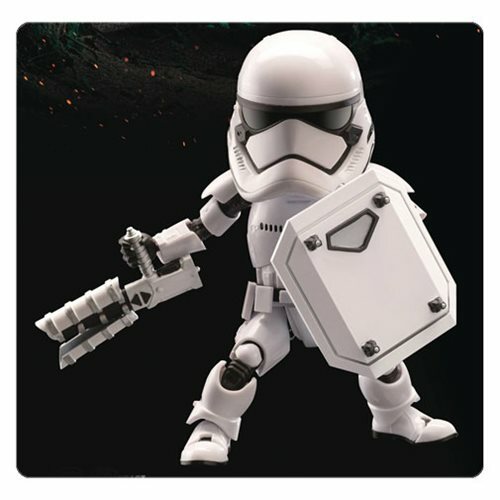 This Star Wars: The Force Awakens Riot Control Stormtrooper Egg Attack Action Figure - Previews Exclusive comes with 3 sets of interchangeable hands and an exclusive support stand. The Riot-Control Stormtrooper is ready to report for duty as part of your own well-armed First Order! Ages 14 and up.